The Arabidopsis genome encodes numerous iron-containing proteins such as iron-sulfur (Fe-S) cluster proteins and hemoproteins. These proteins generally utilize iron as a cofactor, and they perform critical roles in photosynthesis, genome stability, electron transfer, and oxidation-reduction reactions. Plants have evolved sophisticated mechanisms to maintain iron homeostasis for the assembly of functional iron-containing proteins, thereby ensuring genome stability, cell development, and plant growth. Over the past few years, our understanding of iron-containing proteins and their functions involved in genome stability has expanded enormously. In this review, I provide the current perspectives on iron homeostasis in Arabidopsis, followed by a summary of iron-containing protein functions involved in genome stability maintenance and a discussion of their possible molecular mechanisms. The apo-forms of iron-containing proteins utilize iron as a cofactor to assemble their functional holoproteins. , The mammalian and yeast iron-containing proteins exhibit extensive functions in electron transfer, telomere maintenance, genome stability, and cell cycle control. , Similarly, the Arabidopsis genome also encodes numerous iron-containing proteins, including 107 putative and confirmed Fe-S proteins; 246 cytochrome P450 (CYP) members; 7 cytochrome b5 (Cb5) proteins; over 100 proteins involved in heme synthesis and heme binding; 12 putative and confirmed iron-containing dioxygenases; 4 iron-dependent SODs; and 3 RNR small subunits (from The Arabidopsis Information Resource, TAIR, http://www.arabidopsis.org/). Some of them have been directly characterized or implicated to play important roles in genome stability, such as DNA polymerases, DNA primase large subunits, DNA helicases, DNA glycosylases, peroxidase superfamily proteins, Cb5 proteins, cytochrome c (CYTc), SODs, and the small subunits of RNR [Table 1]. Additionally, some iron-containing proteins are also involved in the maintenance of genome stability through indirect ways. For instance, the biogenesis and maturation of cytosolic Fe-S proteins require the function of a dedicated Fe-S cluster assembly pathway, namely, cytosolic iron-sulfur cluster assembly (CIA) machinery. , The CIA pathway is necessary for transferring Fe-S clusters to target proteins such as DNA polymerases, DNA primases, DNA helicases, and RNRs in mammals and yeast. 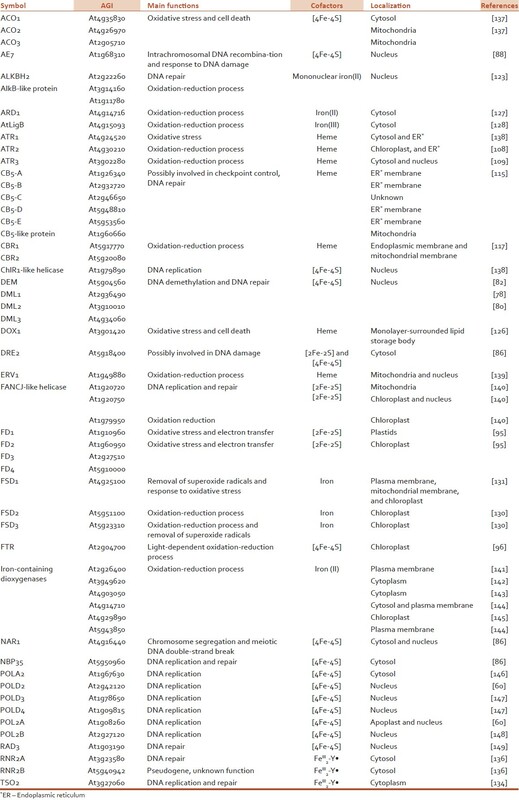 ,,, Thus, the disruption of proteins involved in the CIA pathway possibly affects the stability of target proteins, resulting in genome instability [Table 1]. Most iron acquired by the roots is ultimately delivered to above-ground portions of the plant via the xylem. During this process, iron needs to cross several different membrane barriers. Plants utilize a sophisticated system to deliver iron from root epidermal cells to leaf cells. A variety of transporters have been identified to be involved in the iron translocation process in Arabidopsis, including (ferric reductase defective 3, At3g08040) FRD3 and the yellow stripe-like (YSL) family of proteins (YSL1-8). FRD3 facilitates citrate efflux into the xylem, and the mutation of FRD3 results in Fe localizing to the central vascular cylinder of the roots and failing to transport it to the aerial parts. The YSL family of proteins transport, it is suggested, metals complexed with NA. In Arabidopsis, YSL1 (At4g24120) and YSL3 (At5g53550) are important for iron transport and also responsible for loading Fe, Cu, and Zn from leaves into seeds. YSL4 (At5g41000) and YSL6 (At3g27020) are suggested to control iron release from the chloroplast,  and they are also involved in iron transport and metal mobilization into seeds. The transport functions of YSL1 and YSL2 (At5g24380) are shown to partially overlap with the function of YSL3 in vegetative structures, but they are distinct in the reproductive organs. The functions of YSL7 and YSL8 in iron translocation have not been characterized. Numerous Fe-S cluster proteins are reported to function in genome stability maintenance in Arabidopsis. These proteins mainly include DNA polymerases, DNA helicases, DNA glycosylases, the large subunit of DNA primase, and components of the CIA system. Eukaryotes mainly utilize three conserved polymerases (Polα, Pold, and Polε) to build DNA blocks. Polα is associated with DNA primases to synthesize short RNA primers, which are subsequently utilized by Polε and Pold to synthesize the leading and lagging strands, respectively. ,, All the three DNA polymerases and the large subunit of primase contain a Fe-S cluster. Arabidopsis has a DNA polymerase α (POLA2, At1g67630), three members of polymerase d (POLD2-At2g42120, POLD3-At1g78650, and POLD4-At1g09815), two catalytic subunits of Polε (POL2A-At1g08260 and POL2B-At2g27120), and a large subunit of DNA primase (At1g67320). Although the functions of Arabidopsis DNA polymerases are less characterized, their amino acid sequences share a high degree of similarity to their corresponding homologues in yeast and mammals, implicating their conserved functions in DNA replication. In rice, the expression of DNA polymerase d catalytic subunit (POLD1, Os11g0186400) can be detected in mature leaves and is induced under ultraviolet (UV) irradiation treatment,  supporting the conclusion that POLD is required for DNA replication in plants. In Arabidopsis, both POL2A and POL2B contain the conserved domains that are present in other eukaryotic homologues. Mutations of POL2A result in DNA replication defects,  while pol2b mutants have no visible phenotypic effects. These results suggest that POL2B is not essential for DNA replication or that POL2B functions redundantly with other DNA polymerases. DNA helicases are highly conserved enzymes that function to unwind DNA in order to provide a single-stranded DNA for replication, RNA transcription, DNA repair, and recombination. , Defects of helicases are generally associated with genomic instability in yeast and mammals. The Arabidopsis genome encodes numerous proteins exhibiting helicase activities, and these proteins include AtFANCM (At1g35530), AtINO80 (At5g57300), AtMER3 (or AtRCK, At3g27730), AtRAD54 (At3g19210), AtRAD5A (At5g22750), AtRECQ2 (At1g31360), AtRECQ4A (At1g10930), AtSRS2 (At4g25120), AtSWR1 (At5g37055), RAD3 (UVH6) (At1g03190), three homologues of human Fanconi anemia group J protein (FANCJ) helicase (At1g20720, At1g20750, and At1g79950), and a homologue of human ChlR1 helicase (At1g79890) (according to TAIR). Among the proteins listed above, only RAD3, the homologues of FANCJ helicase, and the homologue of ChlR1 helicase contain a Fe-S cluster. The Arabidopsis RAD3 (also known as UVH6) is a homologue of the human XPD and yeast RAD3. Both XPD and yeast RAD3 are essential helicases, with roles in the repair of damaged DNA through the nucleotide excision repair (NER) mechanism. , The Fe-S cluster in yeast RAD3 is essential for the coupling of adenosine triphosphate (ATP) hydrolysis to DNA translocation and for targeting the helicase to the DNA junction. The uvh6-1 mutant is hypersensitive to both UV-C and UV-B irradiation, implicating its important role in DNA repair. The human FANCJ helicase has been identified to catalyze the unwinding of duplex DNA and G-quadruplex structures in an ATP hydrolysis-dependent manner to ensure genomic stability. The Arabidopsis genome encodes three FANCJ-like proteins, but their functions are still not characterized. ChlR1 belongs to the FANCJ-like DNA helicase family and it contains a DEAH/DEAD box,  which is required for unwinding nucleic acids and is involved in various aspects of RNA metabolism. The deletion of ChlR1 in mammalian cells can lead to DNA damage accumulation, suggesting its important role in efficient DNA repair during DNA replication. However, the function of Arabidopsis ChlR1-like helicase remains unclear. Some of the CIA components have been found to function in DNA replication and repair processes in different organisms. However, little is known about the roles of ISC and SUF members in genome stability. The CIA machinery members in Arabidopsis include NAR1 (At4g16440), CIA1 (At2g26060), NBP35 (At5g50960), AE7 (At1g68310), MET18 (also named MMS19, At5g48120), DRE2 (At5g18400), TAH18 (also named ATR3, At3g02280), ATM3 (At5g58270), and ERV1 (At1g49880). The yeast CIA pathway proteins NAR1, CIA1, CIA2, and MET18, and their corresponding human homologues IOP1, CIAO1, MIP18, and MMS19, it is proposed, transfer Fe-S clusters to the target proteins. ,,, More importantly, both the human and yeast MMS19 proteins interact with numerous Fe-S proteins, including Pold, DNA primase, Dna2, XPD, RTEL1, and FANCJ. Similarly, the Arabidopsis AE7-CIA1-NAR1-MET18 complex has been indicated to facilitate the transfer of Fe-S clusters to the target apoproteins such as ACO (aconitase) and ROS1. In addition, the Arabidopsis CIA pathway has also been suggested in the maintenance of nuclear genome integrity through Fe-S proteins involved in DNA metabolism. Mutations of CIA members including AE7 and ATM3 lead to the accumulation of DNA damage and the increase of homologous recombination (HR) rates. Therefore, it is highly possible that genomic integrity defects in ae7 and atm3 mutants result from inefficient assembly of the Fe-S cluster proteins involved in DNA replication and repair. Taken together, the CIA pathway plays a critical role in maintaining genome integrity, due to the importance of the Fe-S proteins in DNA replication and repair. genome stability mainly include CYP reductase (CPR), Cb5, and CYTc. CPR is the most imperative redox partner of CYPs. Human CPR and NADPH-dependent CPR can act as sources of endogenous oxidative DNA damage and are required for genome stability. The Arabidopsis genome encodes 246 P450 genes, which can be grouped into 72 families. Their biological functions range from the synthesis of macromolecules, hormones, and signaling molecules, and to the metabolism of xenobiotics. However, the functions of numerous P450 genes remain unclear. The Arabidopsis genome encodes two authentic and one putative CPR genes, namely, ATR1 (At4g24520), ATR2 (At4g30210), and ATR3 (At3g02280), respectively. ATR1 is required for electron transfer from NADP to CYPs in microsomes. In particular, it can provide electrons to heme oxygenase and Cb5. ATR2 contributes to the first oxidative step of the phenylpropanoid general pathway. ATR3 serves as a diflavin reductase and is essential for Arabidopsis embryo development. Interestingly, ATR3 exhibits CYTc reductase activity, but not P450 reductase activity. The yeast two-hybrid screening has identified that ATR3 can interact with two Fe-S proteins, the human CIAPIN1 and the yeast Dre2 protein. These results suggest that ATR3 may function in genome stability either by ways similar to CYTc or by interacting with Fe-S proteins. The Arabidopsis genome encodes five Cb5 members (CB5A-E, referring to At1g26340, At2g32720, At2g46650, At5g48810, and At5g53560, respectively) and one Cb5-like protein (At1g60660). Four of them including, CB5A, -B, -D, and -E are predicted to localize in the ER membrane. , However, little is known about the specific functions of individual Cb5 proteins. These proteins share a high degree of amino acid sequence similarities, suggesting the high possibility that they function redundantly. Two Cb5 reductases, namely, CBR1 (At5g17770) and CBR2 (At5g20080) are present in the endoplasmic membrane and the inner mitochondrial membrane, respectively. CBR1 is essential for a functional male gametophyte. Although both CBR1 and CBR2 are also predicated to function as FAD/NAD-binding oxidoreductases, further studies are still needed to uncover their biological roles. CYTc is a small hydrophilic hemoprotein that is extensively present in the mitochondrial inner membrane. CYTc participates in many biological processes, such as respiration, apoptosis, cell death, oxidative stress, DNA damage, energetic metabolism, protein folding, and translational regulation. , In Arabidopsis, CYTc is encoded by CYTC-1 (At1g22840) and CYTC-2 (At4g10040). The knocking-out of both genes causes lethality in plants, whereas the individual mutants have no visible phenotype. These results suggest that CYTC-1 and CYTC-2 function redundantly. Moreover, plants with decreased CYTc exhibit developmental delay, the alteration of stress-responsive gene expression, and the reduction of ROS levels,  implying that CYTc in Arabidopsis also functions as conservatively as other eukaryotes. Besides Fe-S proteins and hemoproteins, Arabidopsis also contains many other iron-containing proteins involved in genome stability, such as dioxygenases, SODs, and RNRs. Some dioxygenases can utilize iron to incorporate into active sites for the assembly of holoproteins. , These iron-containing dioxygenases have been identified to be involved in the DNA repair process. For instance, the Fe(II)/2-oxoglutarate-dependent dioxygenase alpha-ketoglutarate-dependent dioxygenase (AlkB) is extensively present in Escherichia More Details coli and in mammals. The AlkB protein performs a conserving function in the oxidative removal of damaged DNA via alkylation. Failure to remove damaged DNA generally leads to cytotoxicity or mutagenesis during DNA replication. The Arabidopsis genome encodes several AlkB homologues, including ALKBH2 (At2g22260), At3g14160, and At1g11780. In them, the ALKBH2 protein can protect Arabidopsis against DNA methylation damage. The alkbh2 knockout mutants are hypersensitive to the MMS. However, functions of the other two genes have not been characterized. Additionally, another nine genes are also annotated as iron-containing dioxygenases, and these are At2g26400, At3g01420, At3g49620, At4g03050, At4g14710, At4g14716, At4g15093, At4g29890, and At5g43850. Of them, At3g01420, also termed DOX1, encodes a α-dioxygenase that protects plants against oxidative stress and cell death. Recently, it has been shown to be an important component that positively regulates programmed cell death (PCD). The At4g14716 gene encodes an acireductone dioxygenase 1 (ARD1) and functions as an effector of the β subunit of heterotrimeric G protein, which may participate in the synthesis of ethylene. The At4g15093 gene, or AtLigB, is annotated as an extradiol ring-cleavage enzyme, and contributes to arabidopyrone (AP) biosynthesis. The functions of the other six putative iron-containing dioxygenases have not been characterized. RNRs are critical enzymes that catalyze a rate-limiting step in the synthesis of deoxyribonucleotides (dNTPs), thereby generating the precursors needed for DNA replication and repair. , Eukaryotic RNRs comprise the large subunits (α or R1) and small subunits (β or R2), of which only R2 subunits utilize iron to sustain a diferric tyrosyl radical (Fe III2 -Y•) cofactor. Previous studies in yeast and mammals have revealed that the defects of RNRs result in imbalanced dNTP pools in vivo, which generally leads to increased DNA mutations, DNA breaks, cell death, and p53-dependent apoptosis. , The Arabidopsis genome encodes three R2-like proteins, including TSO2 (At3g27060), RNR2A (At3g23580), and RNR2B (At5g40942). Interestingly, the individual genes contribute to unique aspects of the cellular response to DNA damage. For instance, the expression of RNR2A and RNR2B is specifically activated by the replication-blocking agent hydroxyurea (HU) but not by DNA double-strand break inducer bleomycin (BLM). On the other hand, the transcription of TSO2 is only induced in response to BLM. The tso2 single and tso2rnr2a double mutants show extreme sensitivity to UV-C light. Importantly, these mutants exhibit increased DNA damage and PCD relative to the wild-type. These results further indicate that the R2 subunits of RNRs function critically in genome stability maintenance. The Arabidopsis iron-containing proteins involved in genome stability share a high degree of functional conservation with mammals and yeast. Interestingly, some proteins, such as DNA polymerase d and ε, FANCJ helicase homologues, iron SODs, and small subunits of RNR, evolve several copies in Arabidopsis relative to mammals and yeast. As a result, some of them may function redundantly. Therefore, their single mutants have no visible phenotype in DNA damage stresses, resulting in difficulties to characterize their functions. Moreover, plants also evolve numerous CYP proteins that function in the oxidation/reduction of endogenous or exogenous compounds. However, the functions of individual genes in this superfamily are poorly understood, especially in genome stability maintenance. Although studies have extensively demonstrated that iron-containing proteins are required for genome stability, limited information is available regarding their functional mechanisms. Several iron-containing proteins such as DNA helicase RAD3 and small subunits of RNR directly participate in DNA replication and repair. Some iron-containing DNA glycosylases are involved in genome stability due to their participation in DNA methylation. Some CIA components of Fe-S proteins are involved in genome stability possibly because they can transfer Fe-S clusters to target proteins such as Pold, DNA primase, Dna2, XPD, RTEL1, and FANCJ. Importantly, numerous hemoproteins in Arabidopsis function in electron transport; as such, defects in them generally cause the induction of ROS, which can damage DNA, proteins, and lipids. Taken together, although considerable progress has been made in the past years, further studies are still needed to uncover the functions of these iron-containing proteins, especially in genome stability maintenance. We apologize to our colleagues whose work is not cited due to limitations of space. Lill R. Function and biogenesis of iron-sulphur proteins. Nature 2009;460:831-8. Zhang C. Essential functions of iron-requiring proteins in DNA replication, repair and cell cycle control. Protein Cell 2014;5:750-60. Zhang C, Zhang F. Iron homeostasis and tumorigenesis: Molecular mechanisms and therapeutic opportunities. Protein Cell 2015;6:88-100. Crichton RR. Iron Metabolism: From Molecular Mechanisms to Clinical Consequences. 3 rd ed. Chichester, UK: John Wiley & Sons; 2009. p. 223-69. Johnson DC, Dean DR, Smith AD, Johnson MK. Structure, function, and formation of biological iron-sulfur clusters. Annu Rev Biochem 2005;74:247-81. Prabhulkar S, Tian H, Wang X, Zhu JJ, Li CZ. Engineered proteins: Redox properties and their applications. Antioxid Redox Signal 2012;17:1796-822. Lill R, Dutkiewicz R, Elsässer HP, Hausmann A, Netz DJ, Pierik AJ, et al. Mechanisms of iron-sulfur protein maturation in mitochondria, cytosol and nucleus of eukaryotes. Biochim Biophys Acta 2006;1763:652-67. Ouattara M, Pennati A, Devlin DJ, Huang YS, Gadda G, Eichenbaum Z. Kinetics of heme transfer by the Shr NEAT domains of Group A Streptococcus. Arch Biochem Biophys 2013;538:71-9. Murphy ER, Sacco RE, Dickenson A, Metzger DJ, Hu Y, Orndorff PE, et al. BhuR, a virulence-associated outer membrane protein of Bordetella avium, is required for the acquisition of iron from heme and hemoproteins. Infect Immun 2002;70:5390-403. Dlouhy AC, Outten CE. The iron metallome in eukaryotic organisms. Met Ions Life Sci 2013;12:241-78. Miner KD, Klose KE, Kurtz DM Jr. An HD-GYP cyclic di-guanosine monophosphate phosphodiesterase with a non-heme diiron-carboxylate active site. Biochemistry 2013;52:5329-31. Andreini C, Bertini I, Cavallaro G, Najmanovich RJ, Thornton JM. Structural analysis of metal sites in proteins: Non-heme iron sites as a case study. J Mol Biol 2009;388:356-80. Costas M, Mehn MP, Jensen MP, Que L Jr. Dioxygen activation at mononuclear nonheme iron active sites: Enzymes, models, and intermediates. Chem Rev 2004;104:939-86. Couturier J, Touraine B, Briat JF, Gaymard F, Rouhier N. The iron-sulfur cluster assembly machineries in plants: Current knowledge and open questions. Front Plant Sci 2013;4:259. Weerapana E, Wang C, Simon GM, Richter F, Khare S, Dillon MB, et al. Quantitative reactivity profiling predicts functional cysteines in proteomes. Nature 2010;468:790-5. Gari K, León Ortiz AM, Borel V, Flynn H, Skehel JM, Boulton SJ. MMS19 links cytoplasmic iron-sulfur cluster assembly to DNA metabolism. Science 2012;337:243-5. Stehling O, Vashisht AA, Mascarenhas J, Jonsson ZO, Sharma T, Netz DJ, et al. MMS19 assembles iron-sulfur proteins required for DNA metabolism and genomic integrity. Science 2012;337:195-9. Vigani G, Zocchi G, Bashir K, Philippar K, Briat JF. Cellular iron homeostasis and metabolism in plant. Front Plant Sci 2013;4:490. Zheng SJ. Iron homeostasis and iron acquisition in plants: Maintenance, functions and consequences. Ann Bot 2010;105:799-800. Deng X, Eriksson M. Two iron-responsive promoter elements control expression of FOX1 in Chlamydomonas reinhardtii. Eukaryot Cell 2007;6:2163-7. Von Wiren N, Mori S, Marschner H, Romheld V. Iron inefficiency in Maize Mutant ys1 (Zea mays L. cv Yellow-Stripe) is caused by a defect in uptake of iron phytosiderophores. Plant Physiol 1994;106:71-7. Vasconcelos MW, Clemente TE, Grusak MA. Evaluation of constitutive iron reductase (AtFRO2) expression on mineral accumulation and distribution in soybean (Glycine max. L). Front Plant Sci 2014;5:112. Vert GA, Briat JF, Curie C. Dual regulation of the Arabidopsis high-affinity root iron uptake system by local and long-distance signals. Plant Physiol 2003;132:796-804. Vert G, Grotz N, Dédaldéchamp F, Gaymard F, Guerinot ML, Briat JF, et al. IRT1, an Arabidopsis transporter essential for iron uptake from the soil and for plant growth. Plant Cell 2002;14:1223-33. Vert G, Barberon M, Zelazny E, Séguéla M, Briat JF, Curie C. Arabidopsis IRT2 cooperates with the high-affinity iron uptake system to maintain iron homeostasis in root epidermal cells. Planta 2009;229:1171-9. Robinson NJ, Procter CM, Connolly EL, Guerinot ML. A ferric-chelate reductase for iron uptake from soils. Nature 1999;397:694-7. Connolly EL, Fett JP, Guerinot ML. Expression of the IRT1 metal transporter is controlled by metals at the levels of transcript and protein accumulation. Plant Cell 2002;14:1347-57. Colangelo EP, Guerinot ML. The essential basic helix-loop-helix protein FIT1 is required for the iron deficiency response. Plant Cell 2004;16:3400-12. Yuan Y, Wu H, Wang N, Li J, Zhao W, Du J, et al. FIT interacts with AtbHLH38 and AtbHLH39 in regulating iron uptake gene expression for iron homeostasis in Arabidopsis. Cell Res 2008;18:385-97. Wang N, Cui Y, Liu Y, Fan H, Du J, Huang Z, et al. Requirement and functional redundancy of Ib subgroup bHLH proteins for iron deficiency responses and uptake in Arabidopsis thaliana. Mol Plant 2013;6:503-13. Zhang Y, Wu H, Wang N, Fan H, Chen C, Cui Y, et al. Mediator subunit 16 functions in the regulation of iron uptake gene expression in Arabidopsis. New Phytol 2014;203:770-83. Fan H, Zhang Z, Wang N, Cui Y, Sun H, Liu Y, et al. SKB1/PRMT5-mediated histone H4R3 dimethylation of Ib subgroup bHLH genes negatively regulates iron homeostasis in Arabidopsis thaliana. Plant J 2014;77:209-21. Giehl RF, Lima JE, von Wirén N. Regulatory components involved in altering lateral root development in response to localized iron: Evidence for natural genetic variation. Plant Signal Behav 2012;7: 711-3. Schikora A, Schmidt W. Iron stress-induced changes in root epidermal cell fate are regulated independently from physiological responses to low iron availability. Plant Physiol 2001;125:1679-87. Duy D, Wanner G, Meda AR, von Wirén N, Soll J, Philippar K. PIC1, an ancient permease in Arabidopsis chloroplasts, mediates iron transport. Plant Cell 2007;19:986-1006. Palmer CM, Hindt MN, Schmidt H, Clemens S, Guerinot ML. MYB10 and MYB72 are required for growth under iron-limiting conditions PLoS Genet 2013;9:e1003953. Mukherjee I, Campbell NH, Ash JS, Connolly EL. Expression profiling of the Arabidopsis ferric chelate reductase (FRO) gene family reveals differential regulation by iron and copper. Planta 2006;223:1178-90. Lanquar V, Lelièvre F, Bolte S, Hamès C, Alcon C, Neumann D, et al. Mobilization of vacuolar iron by AtNRAMP3 and AtNRAMP4 is essential for seed germination on low iron. EMBO J 2005;24:4041-51. Lanquar V, Ramos MS, Lelièvre F, Barbier-Brygoo H, Krieger-Liszkay A, Krämer U, et al. Export of vacuolar manganese by AtNRAMP3 and AtNRAMP4 is required for optimal photosynthesis and growth under manganese deficiency. Plant Physiol 2010;152:1986-99. Curie C, Briat JF. Iron transport and signaling in plants. Annu Rev Plant Biol 2003;54:183-206. Thomine S, Wang R, Ward JM, Crawford NM, Schroeder JI. Cadmium and iron transport by members of a plant metal transporter family in Arabidopsis with homology to Nramp genes. Proc Natl Acad Sci U S A 2000;97:4991-6. Thomine S, Lelièvre F, Debarbieux E, Schroeder JI, Barbier-Brygoo H. AtNRAMP3, a multispecific vacuolar metal transporter involved in plant responses to iron deficiency. Plant J 2003;34:685-95. Kim SA, Punshon T, Lanzirotti A, Li L, Alonso JM, Ecker JR, et al. Localization of iron in Arabidopsis seed requires the vacuolar membrane transporter VIT1. Science 2006;314:1295-8. Ravet K, Touraine B, Boucherez J, Briat JF, Gaymard F, Cellier F. Ferritins control interaction between iron homeostasis and oxidative stress in Arabidopsis. Plant J 2009;57:400-12. Petit JM, Briat JF, Lobréaux S. Structure and differential expression of the four members of the Arabidopsis thaliana ferritin gene family. Biochem J 2001;359:575-82. Briat JF, Duc C, Ravet K, Gaymard F. Ferritins and iron storage in plants. Biochim Biophys Acta 2010;1800:806-14. Duc C, Cellier F, Lobréaux S, Briat JF, Gaymard F. Regulation of iron homeostasis in Arabidopsis thaliana by the clock regulator time for coffee. J Biol Chem 2009;284:36271-81. Kushnir S, Babiychuk E, Storozhenko S, Davey MW, Papenbrock J, De Rycke R, et al. A mutation of the mitochondrial ABC transporter Sta1 leads to dwarfism and chlorosis in the Arabidopsis mutant starik. Plant Cell 2001;13:89-100. Grennan AK. Identification of genes involved in metal transport in plants. Plant Physiol 2009;149:1623-4. Jain A, Wilson GT, Connolly EL. 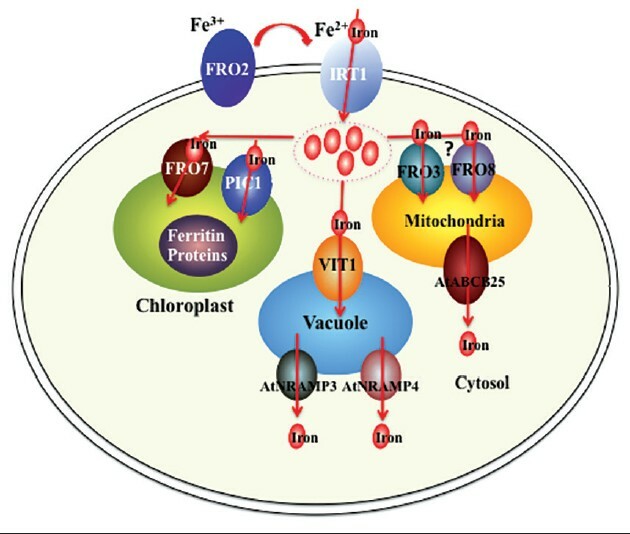 The diverse roles of FRO family metalloreductases in iron and copper homeostasis. Front Plant Sci 2014;5:100. Kobayashi T, Nishizawa NK. Iron uptake, translocation, and regulation in higher plants. Annu Rev Plant Biol 2012;63:131-52. DiDonato RJ Jr, Roberts LA, Sanderson T, Eisley RB, Walker EL. Arabidopsis Yellow Stripe-Like2 (YSL2): A metal-regulated gene encoding a plasma membrane transporter of nicotianamine-metal complexes. Plant J 2004;39:403-14. Waters BM, Chu HH, Didonato RJ, Roberts LA, Eisley RB, Lahner B, et al. Mutations in Arabidopsis yellow stripe-like1 and yellow stripe-like3 reveal their roles in metal ion homeostasis and loading of metal ions in seeds. Plant Physiol 2006;141:1446-58. Divol F, Couch D, Conéjéro G, Roschzttardtz H, Mari S, Curie C. The Arabidopsis YELLOW STRIPE LIKE4 and 6 transporters control iron release from the chloroplast. Plant Cell 2013;25:1040-55. Briat JF, Curie C, Gaymard F. Iron utilization and metabolism in plants. Curr Opin Plant Biol 2007;10:276-82. Thompson JW, Bruick RK. Protein degradation and iron homeostasis. Biochim Biophys Acta 2012;1823:1484-90. Miyabe I, Kunkel TA, Carr AM. The major roles of DNA polymerases epsilon and delta at the eukaryotic replication fork are evolutionarily conserved. PLoS Genet 2011;7:e1002407. Schumacher SB, Stucki M, Hübscher U. The N-terminal region of DNA polymerase delta catalytic subunit is necessary for holoenzyme function. Nucleic Acids Res 2000;28:620-5. Wang X, Ira G, Tercero JA, Holmes AM, Diffley JF, Haber JE. Role of DNA replication proteins in double-strand break-induced recombination in Saccharomyces cerevisiae. Mol Cell Biol 2004;24:6891-9. Shultz RW, Tatineni VM, Hanley-Bowdoin L, Thompson WF. Genome-wide analysis of the core DNA replication machinery in the higher plants Arabidopsis and rice. Plant Physiol 2007;144:1697-714. Uchiyama Y, Hatanaka M, Kimura S, Ishibashi T, Ueda T, Sakakibara Y, et al. Characterization of DNA polymerase delta from a higher plant, rice (Oryza sativa L.). Gene 2002;295:19-26. Garcia E, Quiroz F, Uchiyama Y, Sakaguchi K, Vázquez-Ramos JM. Expression of a maize delta-type DNA polymerase during seed germination. Physiol Plant 2006;127:268-76. Ronceret A, Guilleminot J, Lincker F, Gadea-Vacas J, Delorme V, Bechtold N, et al. Genetic analysis of two Arabidopsis DNA polymerase epsilon subunits during early embryogenesis. Plant J 2005;44:223-36. Jenik PD, Jurkuta RE, Barton MK. Interactions between the cell cycle and embryonic patterning in Arabidopsis uncovered by a mutation in DNA polymerase epsilon. Plant Cell 2005;17:3362-77. Kellermayer R. The versatile RECQL4. Genet Med 2006;8:213-6.
van Brabant AJ, Stan R, Ellis NA. DNA helicases, genomic instability, and human genetic disease. Annu Rev Genomics Hum Genet 2000;1:409-59. Fan L, Fuss JO, Cheng QJ, Arvai AS, Hammel M, Roberts VA, et al. XPD helicase structures and activities: Insights into the cancer and aging phenotypes from XPD mutations. Cell 2008;133:789-800. Sung P, Prakash L, Matson SW, Prakash S. RAD3 protein of Saccharomyces cerevisiae is a DNA helicase. Proc Natl Acad Sci USA 1987;84:8951-5. Pugh RA, Honda M, Leesley H, Thomas A, Lin Y, Nilges MJ, et al. The iron-containing domain is essential in Rad3 helicases for coupling of ATP hydrolysis to DNA translocation and for targeting the helicase to the single-stranded DNA-double-stranded DNA junction. J Biol Chem 2008;283:1732-43. Liu Z, Hong SW, Escobar M, Vierling E, Mitchell DL, Mount DW, et al. Arabidopsis UVH6, a homolog of human XPD and yeast RAD3 DNA repair genes, functions in DNA repair and is essential for plant growth. Plant Physiol 2003;132:1405-14. Wu Y, Brosh RM JR. DNA helicase and helicase-nuclease enzymes with a conserved iron-sulfur cluster. Nucleic Acids Res 2012;40:4247-60. Shah N, Inoue A, Woo Lee S, Beishline K, Lahti JM, Noguchi E. Roles of ChlR1 DNA helicase in replication recovery from DNA damage. Exp Cell Res 2013;319:2244-53. Jacobs AL, Schär P. DNA glycosylases: In DNA repair and beyond. Chromosoma 2012;121:1-20. Sun B, Latham KA, Dodson ML, Lloyd RS. Studies on the catalytic mechanism of five DNA glycosylases. Probing for enzyme-DNA imino intermediates. J Biol Chem 1995;270:19501-8. Krokan HE, Standal R, Slupphaug G. DNA glycosylases in the base excision repair of DNA. Biochem J 1997;325:1-16. Agius F, Kapoor A, Zhu JK. Role of the Arabidopsis DNA glycosylase/lyase ROS1 in active DNA demethylation. Proc Natl Acad Sci U S A 2006;103:11796-801. Wyatt MD, Allan JM, Lau AY, Ellenberger TE, Samson LD. 3-methyladenine DNA glycosylases: Structure, function, and biological importance. Bioessays 1999;21:668-76. Gong Z, Morales-Ruiz T, Ariza RR, Roldán-Arjona T, David L, Zhu JK. ROS1, a repressor of transcriptional gene silencing in Arabidopsis, encodes a DNA glycosylase/lyase. Cell 2002;111:803-14. Lister R, O'Malley RC, Tonti-Filippini J, Gregory BD, Berry CC, Millar AH, et al. Highly integrated single-base resolution maps of the epigenome in Arabidopsis. Cell 2008;133:523-36. Ortega-Galisteo AP, Morales-Ruiz T, Ariza RR, Roldán-Arjona T. Arabidopsis DEMETER-LIKE proteins DML2 and DML3 are required for appropriate distribution of DNA methylation marks. Plant Mol Biol 2008;67:671-81. Schoft VK, Chumak N, Choi Y, Hannon M, Garcia-Aguilar M, Machlicova A, et al. Function of the DEMETER DNA glycosylase in the Arabidopsis thaliana male gametophyte. Proc Natl Acad Sci U S A 2011;108:8042-7. Wöhrmann HJ, Gagliardini V, Raissig MT, Wehrle W, Arand J, Schmidt A, et al. Identification of a DNA methylation-independent imprinting control region at the Arabidopsis MEDEA locus. Genes Dev 2012;26:1837-50. Choi Y, Gehring M, Johnson L, Hannon M, Harada JJ, Goldberg RB, et al. DEMETER, a DNA glycosylase domain protein, is required for endosperm gene imprinting and seed viability in arabidopsis. Cell 2002;110:33-42. Lill R, Mühlenhoff U. Maturation of iron-sulfur proteins in eukaryotes: Mechanisms, connected processes, and diseases. Annu Rev Biochem 2008;77:669-700. Netz DJ, Mascarenhas J, Stehling O, Pierik AJ, Lill R. Maturation of cytosolic and nuclear iron-sulfur proteins. Trends Cell Biol 2014;24:303-12. Luo D, Bernard DG, Balk J, Hai H, Cui X. The DUF59 family gene AE7 acts in the cytosolic iron-sulfur cluster assembly pathway to maintain nuclear genome integrity in Arabidopsis. Plant Cell 2012;24:4135-48. Farooq MA, Pracheil TM, Dong Z, Xiao F, Liu Z. Mitochondrial DNA instability in cells lacking aconitase correlates with iron citrate toxicity. Oxid Med Cell Longev 2013;2013:493536. Arnaud N, Ravet K, Borlotti A, Touraine B, Boucherez J, Fizames C, et al. The iron-responsive element (IRE)/iron-regulatory protein 1 (IRP1)-cytosolic aconitase iron-regulatory switch does not operate in plants. Biochem J 2007;405: 523-31. Sunkar R, Kapoor A, Zhu JK. Posttranscriptional induction of two Cu/Zn superoxide dismutase genes in Arabidopsis is mediated by downregulation of miR398 and important for oxidative stress tolerance. Plant Cell 2006;18:2051-65. Zhao Z, Assmann SM. The glycolytic enzyme, phosphoglycerate mutase, has critical roles in stomatal movement, vegetative growth, and pollen production in Arabidopsis thaliana. J Exp Bot 2011;62:5179-89. Hanke GT, Kurisu G, Kusunoki M, Hase T. Fd: FNR electron transfer complexes: Evolutionary refinement of structural interactions. Photosynth Res 2004;81:317-27. Hanke GT, Satomi Y, Shinmura K, Takao T, Hase T. A screen for potential ferredoxin electron transfer partners uncovers new, redox dependent interactions. Biochim Biophys Acta 2011;1814:366-74. Hanke G, Mulo P. Plant type ferredoxins and ferredoxin-dependent metabolism. Plant Cell Environ 2013;36:1071-84. Keryer E, Collin V, Lavergne D, Lemaire S, Issakidis-Bourguet E. Characterization of Arabidopsis mutants for the variable subunit of ferredoxin: Thioredoxin reductase. Photosynth Res 2004;79:265-74. Stevens JM, Uchida T, Daltrop O, Ferguson SJ. Covalent cofactor attachment to proteins: Cytochrome c biogenesis. Biochem Soc Trans 2005;33:792-5. Mense SM, Zhang L. Heme: A versatile signaling molecule controlling the activities of diverse regulators ranging from transcription factors to MAP kinases. Cell Res 2006;16:681-92. Ohashi T, Mizutani A, Murakami A, Kojo S, Ishii T, Taketani S. Rapid oxidation of dichlorodihydrofluorescin with heme and hemoproteins: Formation of the fluorescein is independent of the generation of reactive oxygen species. FEBS Lett 2002;511:21-7. Danielson PB. The cytochrome P450 superfamily: Biochemistry, evolution and drug metabolism in humans. Curr Drug Metab 2002;3:561-97. Gan L, von Moltke LL, Trepanier LA, Harmatz JS, Greenblatt DJ, Court MH. Role of NADPH-cytochrome P450 reductase and cytochrome-b5/NADH-b5 reductase in variability of CYP3A activity in human liver microsomes. Drug Metab Dispos 2009;37:90-6. Jensen K, Møller BL. Plant NADPH-cytochrome P450 oxidoreductases. Phytochemistry 2010;71:132-41. Gutierrez A, Paine M, Wolf CR, Scrutton NS, Roberts GC. Relaxation kinetics of cytochrome P450 reductase: Internal electron transfer is limited by conformational change and regulated by coenzyme binding. Biochemistry 2002;41:4626-37. Aigrain L, Fatemi F, Frances O, Lescop E, Truan G. Dynamic control of electron transfers in diflavin reductases. Int J Mol Sci 2012;13:15012-41. Heine T, Glatt H, Epe B. Human cytochrome P450 reductase can act as a source of endogenous oxidative DNA damage and genetic instability. Free Radic Biol Med 2006;40:801-7. Werck-Reichhart D, Bak S, Paquette S. Cytochromes p450. Arabidopsis Book 2002;1:e0028. Fukuchi-Mizutani M, Mizutani M, Tanaka Y, Kusumi T, Ohta D. Microsomal electron transfer in higher plants: Cloning and heterologous expression of NADH-cytochrome b5 reductase from Arabidopsis. Plant Physiol 1999;119:353-62. Urban P, Mignotte C, Kazmaier M, Delorme F, Pompon D. Cloning, yeast expression, and characterization of the coupling of two distantly related Arabidopsis thaliana NADPH-cytochrome P450 reductases with P450 CYP73A5. J Biol Chem 1997;272:19176-86. Varadarajan J, Guilleminot J, Saint-Jore-Dupas C, Piégu B, Chabouté ME, Gomord V, et al. ATR3 encodes a diflavin reductase essential for Arabidopsis embryo development. New Phytol 2010;187:67-82. Kumar R, Tran LS, Neelakandan AK, Nguyen HT. Higher plant cytochrome b5 polypeptides modulate fatty acid desaturation. PloS One 2012;7:e31370. Shanklin J, Cahoon EB. Desaturation and related modifications of fatty acids1. Annu Rev Plant Physiol Plant Mol Biol 1998;49:611-41. McConn M, Browse J. Polyunsaturated membranes are required for photosynthetic competence in a mutant of Arabidopsis. Plant J 1998;15:521-30. Mallory JC, Crudden G, Johnson BL, Mo C, Pierson CA, Bard M, et al. Dap1p, a heme-binding protein that regulates the cytochrome P450 protein Erg11p/Cyp51p in Saccharomyces cerevisiae. Mol Cell Biol 2005;25:1669-79. Guénolé A, Srivas R, Vreeken K, Wang ZZ, Wang S, Krogan NJ, et al. Dissection of DNA damage responses using multiconditional genetic interaction maps. Mol Cell 2013;49:346-58. Nagano M, Ihara-Ohori Y, Imai H, Inada N, Fujimoto M, Tsutsumi N, et al. Functional association of cell death suppressor, Arabidopsis Bax inhibitor-1, with fatty acid 2-hydroxylation through cytochrome b 5 . Plant J 2009;58:122-34. Hwang YT, Pelitire SM, Henderson MP, Andrews DW, Dyer JM, Mullen RT. Novel targeting signals mediate the sorting of different isoforms of the tail-anchored membrane protein cytochrome b5 to either endoplasmic reticulum or mitochondria. Plant Cell 2004;16:3002-19. Wayne LL, Wallis JG, Kumar R, Markham JE, Browse J. Cytochrome b5 reductase encoded by CBR1 is essential for a functional male gametophyte in Arabidopsis. Plant Cell 2013;25:3052-66. Welchen E, Hildebrandt TM, Lewejohann D, Gonzalez DH, Braun HP. Lack of cytochrome c in Arabidopsis decreases stability of Complex IV and modifies redox metabolism without affecting Complexes I and III. Biochim Biophys Acta 2012;1817:990-1001. Jiang X, Wang X. Cytochrome C-mediated apoptosis. Annu Rev Biochem 2004;73:87-106. Huttemann M, Pecina P, Rainbolt M, Sanderson TH, Kagan VE, Samavati L, et al. The multiple functions of cytochrome c and their regulation in life and death decisions of the mammalian cell: From respiration to apoptosis. Mitochondrion 2011;11:369-81. Grzyska PK, Appelman EH, Hausinger RP, Proshlyakov DA. Insight into the mechanism of an iron dioxygenase by resolution of steps following the FeIV=HO species. Proc Natl Acad Sci U S A 2010;107:3982-7. Yi C, Jia G, Hou G, Dai Q, Zhang W, Zheng G, et al. Iron-catalysed oxidation intermediates captured in a DNA repair dioxygenase. Nature 2010;468:330-3. Meza TJ, Moen MN, Vågbø CB, Krokan HE, Klungland A, Grini PE, et al. The DNA dioxygenase ALKBH2 protects Arabidopsis thaliana against methylation damage. Nucleic Acids Res 2012;40:6620-31. Falnes PØ, Johansen RF, Seeberg E. AlkB-mediated oxidative demethylation reverses DNA damage in Escherichia coli. Nature 2002;419:178-82. De León IP, Sanz A, Hamberg M, Castresana C. Involvement of the Arabidopsis alpha-DOX1 fatty acid dioxygenase in protection against oxidative stress and cell death. Plant J 2002;29:61-2. García-Marcos A, Pacheco R, Manzano A, Aguilar E, Tenllado F. Oxylipin biosynthesis genes positively regulate programmed cell death during compatible infections with the synergistic pair potato virus X-potato virus Y and Tomato spotted wilt virus. J Virol 2013;87:5769-83. Friedman EJ, Wang HX, Jiang K, Perovic I, Deshpande A, Pochapsky TC, et al. Acireductone dioxygenase 1 (ARD1) is an effector of the heterotrimeric G protein beta subunit in Arabidopsis. J Biol Chem 2011;286:30107-18. Weng JK, Li Y, Mo H, Chapple C. Assembly of an evolutionarily new pathway for α-pyrone biosynthesis in Arabidopsis. Science 2012;337:960-4. Kliebenstein DJ, Monde RA, Last RL. Superoxide dismutase in Arabidopsis: An eclectic enzyme family with disparate regulation and protein localization. Plant Physiol 1998;118:637-50. Myouga F, Hosoda C, Umezawa T, Iizumi H, Kuromori T, Motohashi R, et al. A heterocomplex of iron superoxide dismutases defends chloroplast nucleoids against oxidative stress and is essential for chloroplast development in Arabidopsis. Plant Cell 2008;20:3148-62. Asada K. The water-water cycle in chloroplasts: Scavenging of active oxygens and dissipation of excess photons. Annu Rev Plant Physiol Plant Mol Biol 1999;50:601-39. Abdel-Ghany SE, Pilon M. MicroRNA-mediated systemic down-regulation of copper protein expression in response to low copper availability in Arabidopsis. J Biol Chem 2008;283:15932-45. Wang C, Liu Z. Arabidopsis ribonucleotide reductases are critical for cell cycle progression, DNA damage repair, and plant development. Plant Cell 2006;18:350-65. Kumar D, Viberg J, Nilsson AK, Chabes A. Highly mutagenic and severely imbalanced dNTP pools can escape detection by the S-phase checkpoint. Nucleic Acids Res 2010;38:3975-83. Roa H, Lang J, Culligan KM, Keller M, Holec S, Cognat V, et al. Ribonucleotide reductase regulation in response to genotoxic stress in Arabidopsis. Plant Physiol 2009;151:461-71. Moeder W, Del Pozo O, Navarre DA, Martin GB, Klessig DF. Aconitase plays a role in regulating resistance to oxidative stress and cell death in Arabidopsis and Nicotiana benthamiana. Plant Mol Biol 2007;63:273-87. Farver O, Vitu E, Wherland S, Fass D, Pecht I. Electron transfer reactivity of the Arabidopsis thaliana sulfhydryl oxidase AtErv1. J Biol Chem 2009;284:2098-105. Vandepoele K, Vlieghe K, Florquin K, Hennig L, Beemster GT, Gruissem W, et al. Genome-wide identification of potential plant E2F target genes. Plant Physiol 2005;139:316-28. Sudre D, Gutierrez-Carbonell E, Lattanzio G, Rellán-Álvarez R, Gaymard F, Wohlgemuth G, et al. Iron-dependent modifications of the flower transcriptome, proteome, metabolome, and hormonal content in an Arabidopsis ferritin mutant. J Exp Bot 2013;64:2665-88. Charron JB, Ouellet F, Houde M, Sarhan F. The plant Apolipoprotein D ortholog protects Arabidopsis against oxidative stress. BMC Plant Biol 2008;8:86. Kliebenstein DJ, West MA, van Leeuwen H, Kim K, Doerge RW, Michelmore RW, et al. Genomic survey of gene expression diversity in Arabidopsis thaliana. Genetics 2006;172:1179-89. Pommerrenig B, Feussner K, Zierer W, Rabinovych V, Klebl F, Feussner I, et al. Phloem-specific expression of Yang cycle genes and identification of novel Yang cycle enzymes in Plantago and Arabidopsis. Plant Cell 2011;23:1904-19. Fey V, Wagner R, Braütigam K, Wirtz M, Hell R, Dietzmann A, et al. Retrograde plastid redox signals in the expression of nuclear genes for chloroplast proteins of Arabidopsis thaliana. J Biol Chem 2005;280:5318-28. Takahashi K, Niwa H, Yokota N, Kubota K, Inoue H. Widespread tissue expression of nepenthesin-like aspartic protease genes in Arabidopsis thaliana. Plant Physiol Biochem 2008;46:724-9. Heyndrickx KS, Vandepoele K. Systematic identification of functional plant modules through the integration of complementary data sources. Plant Physiol 2012;159:884-901. Ascencio-Ibáñez JT, Sozzani R, Lee TJ, Chu TM, Wolfinger RD, Cella R, et al. Global analysis of Arabidopsis gene expression uncovers a complex array of changes impacting pathogen response and cell cycle during geminivirus infection. Plant Physiol 2008;148:436-54. Ly V, Hatherell A, Kim E, Chan A, Belmonte MF, Schroeder DF. Interactions between Arabidopsis DNA repair genes UVH6, DDB1A, and DDB2 during abiotic stress tolerance and floral development. Plant Sci 2013;213:88-97.